Six young professionals, including five of the School’s students and alumni, have founded an association called CAP développement durable (CAP DD) to increase awareness and rally young professionals and future decision-makers around climate change issues. Their initial goal was to assemble a delegation to take part in the Conference of the Parties of the United Nations Framework Convention on Climate Change (COP22), held in Marrakesh from November 7 to 18 of this year. They put together and managed to finance a delegation of some 30 participants, and are now working on a series of projects for 2017. CAP DD was founded last year by a multidisciplinary team consisting of Bachir Mouhyi (MSc), Salma Lahmadi (certificate, 2016), Morgane Lassaux (specialized graduate diploma, 2015), Nicolas Eyssallenne (short graduate program, 2016), Marouane Bentefrit (specialized graduate diploma) and Ali Benryane. The association received support from the School soon after it was founded, allowing it to organize a symposium to prepare for the COP in Marrakesh on October 17. During the climate conference in Marrakesh, the delegation organized or co-organized three events: a lecture on technological innovations for a less carbon-intensive economy, a symposium at the Cadi Ayyad University on international co-operation in combatting climate change, and a Morocco–Canada networking evening. 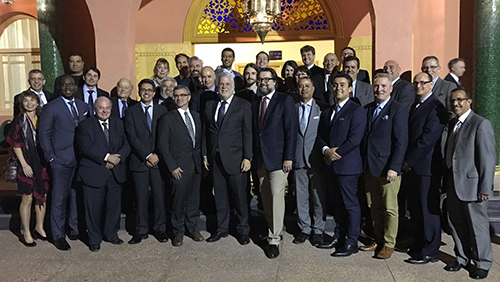 The latter event was attended by Quebec Premier Philippe Couillard, David Heurtel, Minister of Sustainable Development, the Environment and the Fight Against Climate Change, and Nathalie Dubé, Canadian Ambassador to Morocco. *Photo taken at the Morocco–Canada networking evening. Credit: Jean-Christophe Voyer.